The system to extract smoke and heat is a part of the fire installations in buildings. The purpose of such systems is to limit fire dangers and to stop the fire from spreading, thus reducing the fire threat to people and property. The system is designed for each smoke compartment which is in a fire zone. In case of fire and evaluation of sensors, these compartments are activated and extracted. At the start of the fire the smoke and heat extraction system is designed to remove products of combustion and smoke, and afterwards the generated heat as well. Through this process, the system enables better evacuation of people and more efficient fire brigade response. It reduces heating load of the building construction, resulting in decreasing any follow-up damages to the equipment and building caused by hot gases and smoke. Hot gases are removed by the natural and forced smoke and heat system to the outdoors either through a roof flue, fans or ductwork. 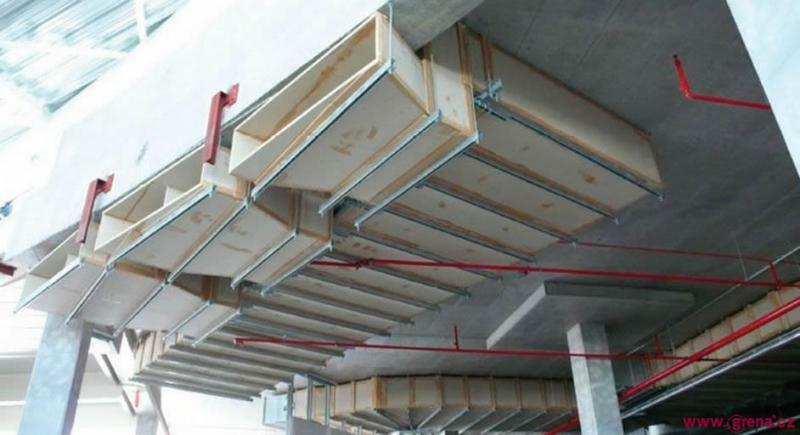 In the standards these systems of duct are specified as the multi-compartment smoke extraction duct and the single-compartment smoke extraction duct. The single-compartment smoke extraction duct is identified for example as E300single, where the number 300 or 600, defines the anticipated temperature of the gases. The duct is then considered to be sufficient with the fire resistance of E 30. The multi-compartment smoke extraction duct is identified for example as EImulti 30 or EImulti 60, where the number 30 or 60, defines the value of the fire resistance. The Grena a.s. company designed and tested the smoke and heat extraction ducts made of the Grenamat AL, boards, which are due to their strength, incombustibility, workability and very good resistance to fire suitable for this type of ductwork. The duct is certified to be used in buildings with more fire zones or with one fire zone to which the duct is taken through other fire zones. The duct may be installed in horizontal or vertical positions with the possible branches, fans or grids integrated into the duct. 1. Joints cemented with Grena Klebepaste, 2. Suspension rods, max. spacing 1.22 m, 3. Joint connections, Grenamat AL 100x10 mm, 4. Supporting sections "U", "L" or "omega", 5. Self-drilling screws, steel clips, 6. Mineral wool - sealing of the penetration through the wall.